The still is made of a 1 litre heat resistant glass flask. Condenser is made of a 1/2" soft copper pipe that is bent with a copper bending tool. Cooling is provided via a 3/16" soft copper tube that is winded by hand onto the larger tube and then soldered in place to provide better heat transfer. This kind of condenser have very good cooling capability. Building the still so the condenser is on top of the flask gives the still better stability. Extra mounting is still necessary to make sure the apparatus wont tilt while distilling. 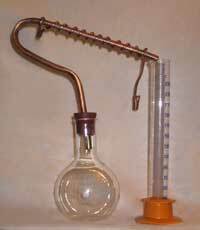 A 75 cm soft 1/2" (12 mm) copper tube is used to make the condenser. Soft copper tubes are easy to bend with a bending tool. The sizes on the picture to the left is just a suggestion. It is not critical to get the sizes shown. As an alternative to using a bending tool, soldering couplings can be used. It's easier to use hard copper pipe then. Cooling is achieved by winding a thin copper tube onto the 1/2" tube. Use 3/16" (4.7 mm) pipe. 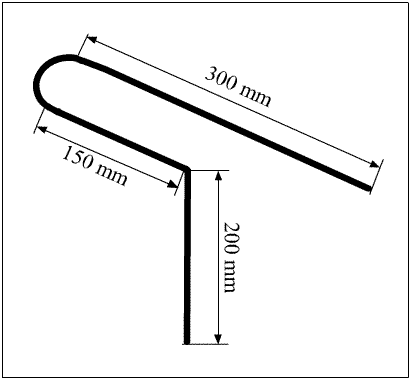 Some brake pipe for cars have this diameter and it shouldn't be hard to find at a spare part reseller. Wind it by hand around the tube and try to make it as tight to the condenser tube as possible. The turns should be around a cm apart. Don't make it too tight together, it becomes to hard to solder it in place then. Use a low temperature solder to solder the thin pipe in place. Using solder increases the heat transfer a lot between cooling water and condenser. Since the alcohol never get in contact with the solder it is possible to use ordinary lead-tin solder. Some solder contains flux so no extra flux is necessary then. If solder without flux is used it's necessary to add flux onto the pipe manually. It is easier to get a good result if flux is added manually. Grease the condenser with plenty of flux and heat the condenser with a propane burner. Add solder and it will creep in between the thin pipe and the condenser. The end result should look something like this. It may be hard to find suitable hose for the 3/16". As an alternative to small hoses an expander can be soldered onto the pipe end. Use a piece of 1/2" pipe and grease the inside with flux. Use tongs to compress the 1/2" pipe so the small pipe fits tight inside. Heat and solder. A one litre boiling flask is suitable as a boiler. Make sure to use a flask that can withstand heat, not all glass flask is made to be used as a boiler. Since glass have a smooth surface it is necessary to add boiling stones of some kind when it's time to distil to prevent flash-boiling. Beware! if You forgot to add boiling-stones when you distil, never add it to a hot liquid since it can react very violently to the superheated liquid. It is essential to let the liquid cool down first. If the rubber cork that is used to connect the flask to the condenser doesn't have a large enough hole for the condenser it can be enlarged. Take a piece of 1/2" pipe and force it down by hand while turning it left and right. Another way is to freeze the cork, that'll make it stiff and then use an ordinary drilling machine to enlarge the hole.